Pipeline Cleaning Pigs, Foam Pigs, Poly Pigs, Pigging Services - THE PIG PEN, INC.
With 27 years of experience, we can meet and exceed all your pigging supply needs. We offer top of the line pigging products to meet any industry type. We also offer consulting to figure out how to increase your pipeline's efficiency all the while along minimal interruption in your production. 'Poly pigs' have many diverse applications and each industry in different. While pigs and pigging supplies is only 8% of our annual sales, it is the backbone on which The Pig Pen Inc was founded. Foam pigs are an inexpensive and versatile type of pipeline cleaning device. They are used for drying, cleaning, batching, and product removal operations in the oil and gas, municipality, food and beverage, mining, chemical and petrochemical, cosmetic and pharmaceutical industries. Because they are lightweight and flexible, foam pigs are able to negotiate uncommon piping, fittings, and valves. Standard sizes range from 2" to 60", with industry-standard densities of foam ranging from 2-pound, 5-pound, and 8-pound per cubic foot. Common configurations include bare, criss-cross, wirebrush, plastic bristle, and silicon carbide. Special configurations can be designed for unique pigging applications. Cleaning pigs are integral for the maintenance of pipeline infrastructure at any stage of the asset’s life – from construction to operation, and for repair and decommissioning. Cleaning pigs can be used to remove dirt or general construction debris that may have been left inside the pipe during construction; during the hydrostatic testing process they can be propelled through the pipeline with the test water as a tool to expel air from the line. Following this, a cleaning pig is used to dewater and dry the pipeline before commissioning. During operation, cleaning pigs are used to remove debris, millscale, paraffin wax and other deposits for a more efficient flow of product, and to control corrosion. Steel pigs are a more long-term, long-life pig. They consist of a steel mandrel body with easily replaceable sealing elements (cups and discs). Various brush types (spring-loaded, circular, wrap-around) can be utilized for removing deposits on the interior pipe wall. Standard configurations include cup, disc, multi-disc, conical and hybrid combination styles with various options such as adding or substituting a cup or disc, special lengths and diameters, gauging plates, articulated joints, transmitter cavities and magnet packs. 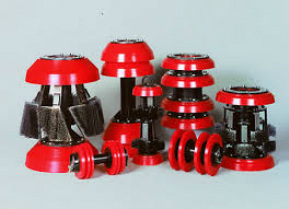 The advantage of steel pigs is the ability to replace the wearing components (cups, discs, brushes, etc. ), thereby rendering it a new pig. Individual specification sheets, found within each product classification, outline the different types of applications, specifications and various design options. Solid and Inflatable spheres are available in different materials specific to the job at hand. Nitrile, Neo-phrene, Viton, Urethanes and other elastomers. These spheres in Nitrile, Neoprene are compression molded and are solid from 1-inch through 4-inch, inflatable from 6-inch through 42-inch for line or prover service. Urethane Spheres are split cast and fussed. The FWP series of foam wiping pigs are an excellent pig for all types of batching and product removal applications. Models are available in 5 and 8 pound per cubic foot foam density. The unique design offers multiple discs and a rear sealing cup for unsurpassed sealing capabilities. Alternate variations of this pig include bidirectional as well as special lengths and diameters for unique applications, including dual-diameter. The FWP series is also available with brush wraps for aggressive cleaning applications. Utilizing the same design objectives and construction material, the one piece Super Cast pipeline pig offers a logical cost alternative to poly foam pigs. Available in diameters from 2″ – 12″, Super Cast Pig is the ideal product for a broad range of applications around refineries, chemical plants, oil pipelines, gas pipelines, and municipal utility lines. 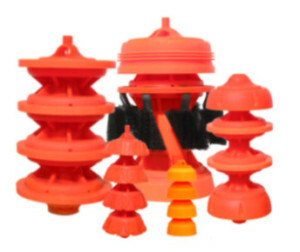 Its soft durometer allows it to last ten times longer than poly foam pigs; it does not have the same disposal and contamination problems; it can easily negotiate 1.5R bends, bridge valves and tees without buckling, tearing, or shredding. The Super Cast Pig always exceeds task requirements and it takes fewer pigs to do it, run after run after run. We supply all sizes of replacement cups and discs for metal steel pigs. If we don't have it, we will find it!